Pioneering tailor-made and luxury holidays since 1962, Abercrombie & Kent has a wealth of knowledge of exotic locations and in crafting beautiful and bespoke travel experiences. 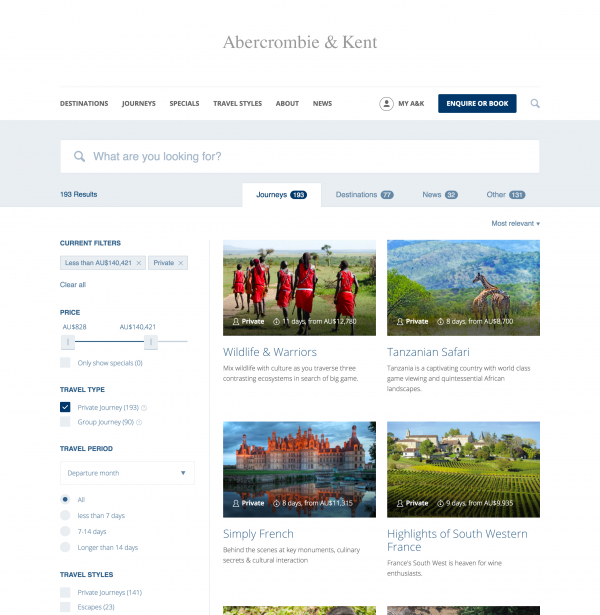 A&K identified frustrations by users with the current search offering and were looking for a redesigned search UX. They engaged us to update the search experience to refine and expand the way search is presented on the website. The result is a powerful, intuitive and visual search engine that allows users to discover a broader range of content on the website. A&K identified that the current search experience on its website assumed that a person already had some idea of the type of trip that they would like to take and thus are most interested in searching available journeys. This functionality presents frustrations for users who are earlier in the consideration phase, who would like a more exploratory search experience where they can discover destinations, journeys and different travel experiences. We were engaged by A&K to develop a powerful search experience that caters to users at every phase of the consideration journey. The updated search interface needed to appear in two locations: when the user clicks on the search icon in the navigation header or visits the homepage. Both search locations pass the user over to the new site-wide search. Search results should deliver content from across the website, as opposed to just the journeys section. 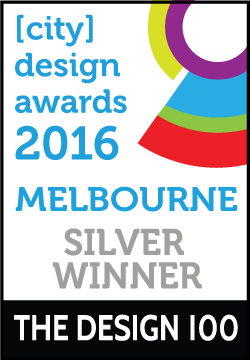 The purpose was to deliver the user a more immersive search experience. Site search on the website was previously powered by a Google Custom Search engine (GCS). While powerful and cost-effective, there were limitations to how search results are presented, and no ability to customise the results, or prioritise certain types of content over others. As such, we recommended and implemented Algolia search software. Search is an important part of the user journey and the goal is to make the website’s search functionality more efficient for users; as such, we anticipate time on site to drop as users are finding what they are looking for faster and more efficiently. Additionally, updates were required to be made to improve the functionality and appearance of the journey-specific search, which appears when a user is already in the journey section of the website. Previously, when the user clicked on the search icon or visited the homepage they would only see a journey-specific search. While the user could click 'search site' in order to search all website content, data suggested this was not often being done. The updated UX retains the search-from-header functionality, and now also presents a simple text field for the user to input their search term. The complexity presented by having multiple search options was removed. This search executes a full site search, rather than journey-specific content. 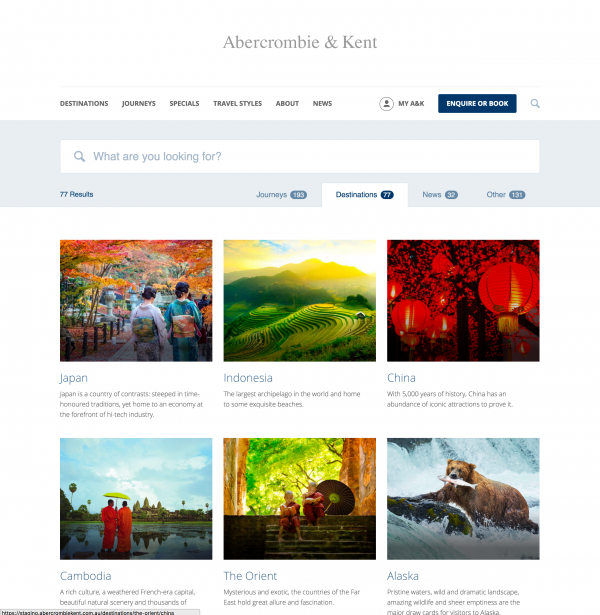 We replaced Google Custom Search with Algolia to deliver users of the Abercrombie & Kent website a beautiful, responsive, and immersive search experience, allowing them to surface and discover a range of content quickly, easily and in real-time after every keystroke. With UX enhancements to the search results page, we delivered a search experience based on a single text field that instantly returns relevant results, and provides a range of facets to enable the user to further refine and adjust the results. Algolia retains user search queries and data, however personal user information is not stored.